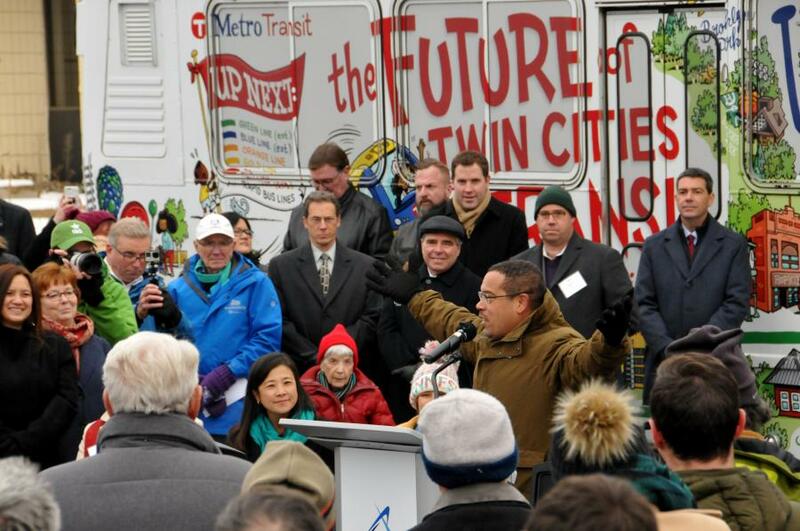 U.S. Rep. Keith Ellison, D-5, speaks about the Southwest Light Rail project at the groundbreaking ceremony. 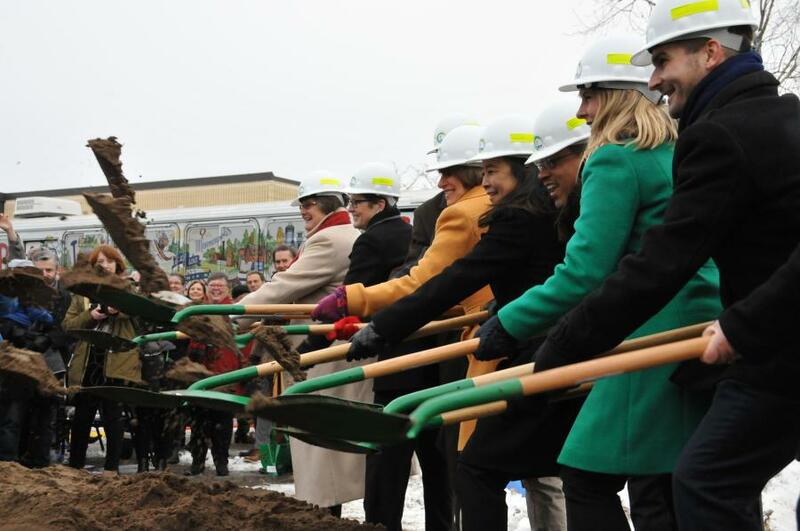 Partners from across the region joined the Hopkins Metropolitan Council and Hennepin County Board Nov. 30 at a ceremonial groundbreaking of the Southwest Light Rail project. The $2.003 billion project will be the largest infrastructure project in the state's history and is expected to create 7,500 construction jobs, with an estimated $350 million payroll. "This day has been long-awaited and hard-earned," said Gov. Mark Dayton. "The Southwest Light Rail Transit project is a critical economic development project for the people of Minnesota. When complete, it will improve many thousands of lives from Eden Prairie to North Minneapolis. It will create new jobs, reduce highway congestion, and better connect Minnesotans to one another." The groundbreaking was held in Hopkins, at the site of a future rail support facility. More than 100 people joined in the celebration, which included remarks by U.S. Sen. Amy Klobuchar, U.S. Sen. Tina Smith, U.S. Rep. Keith Ellison, Minnesota House Speaker-elect Melissa Hortman, Hennepin County Board Chair Jan Callison, Hennepin County Commissioner Peter McLaughlin, Hopkins Mayor Molly Cummings, Metropolitan Council Member Gail Dorfman, Minneapolis Chamber of Commerce President and CEO Jonathan Weinhagen and Metropolitan Council Chair Alene Tchourumoff. In her remarks, Tchourumoff noted that dozens of partners and hundreds of people played a role in getting the project to this point. "This is an important moment for our region," she said. "After decades of work, Southwest LRT is becoming a reality. This project is the result of partnerships, at the federal, state, county, local, and community level. Its planning alone has attracted millions of private economic development along the corridor, generating a return on investment before the first shovels even hit the ground. And once it's built, it will connect thousands of people across the region with jobs, education, opportunities, and more." The council is moving into construction of the project after receiving a Letter of No Prejudice (LONP) from the FTA earlier this month, which makes early construction work on the project eligible for federal reimbursement upon award of the Full Funding Grant Agreement (FFGA), anticipated in 2019. With the FFGA, the federal government would pay $929 million — nearly half — of the project's total cost. Receipt of the LONP allowed a variety of actions to move forward, including the Metropolitan Council awarding a construction contract to Lunda/C.S. McCrossan for $799.5 million, as well as approvals from Hennepin County, the project's primary local funding. "A successful transportation system is a bedrock that keeps our economy growing and creates opportunities for our residents, businesses, and communities," said McLaughlin. "Transit is a critical piece of our transportation system. It works alongside roads, bridges, bikeways and walkways to connect people to the places they need to go. As our region grows, our transit network needs to grow, as well. Today, we celebrate the great progress we're making in that direction." Early construction activities this winter could include staffing and equipment mobilization, site clearance, demolition and utility work. Heavy construction would take place from 2019 to 2022, with testing of the system with new light rail vehicles anticipated in 2022 or 2023. SWLRT is expected to begin passenger service in 2023 as an extension of the METRO Green Line. The existing Green Line received nine LONPs to allow it to move forward with construction before receiving the FFGA in 2011. SWLRT is a 14.5-mi. line with 16 stations serving Minneapolis, St. Louis Park and nearby Edina, Hopkins, Minnetonka and Eden Prairie. Once open, it is expected to see weekday ridership of 34,000. In 2014, there were approximately 64,300 jobs within a half mile of the proposed stations and 126,800 jobs in downtown Minneapolis. By 2035, employment is expected to grow to 80,900 within a half mile of the proposed stations and 145,300 in downtown Minneapolis — an 18 percent increase. The population along the line outside of downtown Minneapolis is expected to grow by 56 percent from 2014 to 2035. For more information, visit SWLRT.org.